I often wondered what office gossip is. How does office gossip start and what purpose does it have in an office environment? Is it just human nature intertwined with a working environment? Is it simply, gossip that just happened to be expressed in an office environment. Is office gossip really a thing? Well, I decided to engage in office gossip to get the bottom of this mystery. Now, we often hear of office gossip being one of the signs that you are in a toxic work environment. People talking about things that doesn’t really concern them…talking about someone or something that leads to perceived conspiracy theories. In a survey of 3,022 people, a whopping 89% of full time employees have admitted to wasting time at work each day and wait for it…a whopping 42% of these time wasters admitted to actually spending that wasted-time gossiping. Wow, no wonder professionals believe that one of the tell-tale signs that a toxic working environment exists is office gossip. In my experiment engaging in office gossip, so that I can understand what office gossip actually is and why it occurs, I uncovered a fascinating web of reasons and beliefs. From reasons to “its in our nature”, “that’s normal”, “my boss does it”, to… “really, its not gossip, its sharing information”, “I don’t gossip”, “its lies about someone”. Whilst I know there are many reasons for office gossip, there were two findings that really stuck with me and I want to share that with you. Talking with over 50 employees, I discovered that the number one reason for office gossip was selfishness. Yes, you read right, I have put it down to “selfishness”. 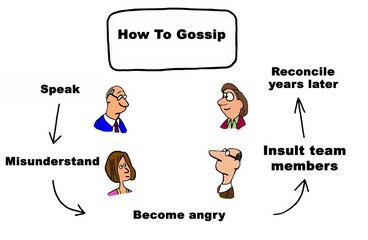 As I explored the world of office gossip, I’ve come to learn who are the main culprits of starting office gossip. Engaging with these individuals, I have learned that every piece of information passed, even though it was not theirs to pass on, started with, “I am going to tell you something, but you cannot tell anybody” …hold the phone! So, I am going to be burdened with information that I cannot share? I was happily waltzing along until you shared something with me and placed a huge caveat that I cannot share this information with anybody. Sharing information that is not yours to share is selfishness. Selfish because of ones’ own desire to tell somebody about it and put them in a difficult position. It makes them feel relieved that they are not walking around with this information bursting to tell somebody. If you tell somebody something, expect that message to go viral. If its meant to be a secret, do not share if its comes with the caveat…” Don’t tell anybody”. I found that office gossip thrives in environments that lack management principles. The lack of principles around communication at various levels led to false truths or “boredom-derived” assumptions. Whether it is a manager addressing his/her staff or peers trading information, the lack of principles allowed office gossip to flow. In many of the group interviews that I had conducted, I found that staff where often addressed by management with information that came with caveats and the moment being… “It’s not common knowledge, so its stays within these walls”. Radical transparency as a principle that means clear guidance on sharing information. Radical transparency as a principle which means information that is on the shop floor is actually meant to be there. It means that the only “real” or “actual” gossip that makes its way to the shop floor, is lies and deceit, which with appropriate principles can be managed. Principles around communication means that a manager would never use the words, “It’s not common knowledge, so its stays within these walls”. How about this, if information is to be shared, expect it to go viral. How about, “it’s not common knowledge “full stop”. Caveats around sharing information brings us back to point number 1…Selfishness. It’s astounding that even though we know that information shared in some shape or form will make its way to the general public, we still share it although it’s not ours to share, but we do so with caveats. Then we’d get disappointed that the information has been shared without any self-reflection that we were being selfish to begin with and if we really did not want the information out there, we should have never shared it to begin with. So, my findings have lead me to understand the primary cause of office gossip, Selfishness, and how with good principles, office gossip can be managed.